Since 2014, the 100 Year-Vision scholarship has provided talented orphaned students from sub-Saharan African countries with the opportunity to apply for and to potentially pursue a higher education (for the level of undergraduate degree) at the world's leading universities outside Africa. Important: There is no application fee. Do not pay any money to anybody. Students are required to complete an application and submit copies of all academic and identity documents. There are three ways to apply for the 100-Year Vision Scholarship – Online (preferred option), By Email or By Post. 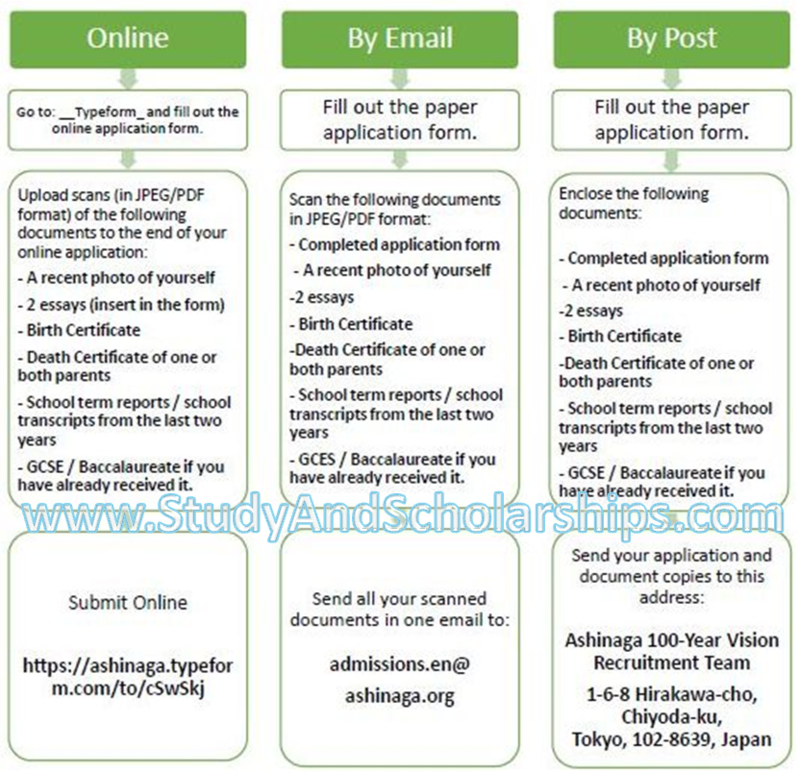 Please choose one method and submit all the correct documents before the deadline. See the image below to guide you. All documents must be submitted in English, French, or Portuguese. If it is not one of these three languages, candidates must have the documents translated. Application for francophone countries is now open. See the 2017 announcement. It is important to read through this francophone guideline(pdf) and also visit the official website (link to it is below) for complete information on how to apply. 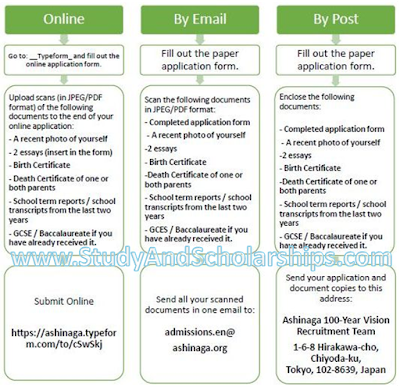 Ashinaga is a Non-Profit Organization based in Japan that support bereaved students educationally, emotionally and financially, ranging from infancy right up to the completion of higher education. The organisation has supported young people in Japan for around 50 years but expanded to start helping students internationally in 1999 after the natural disasters in Turkey, Colombia and Taiwan.